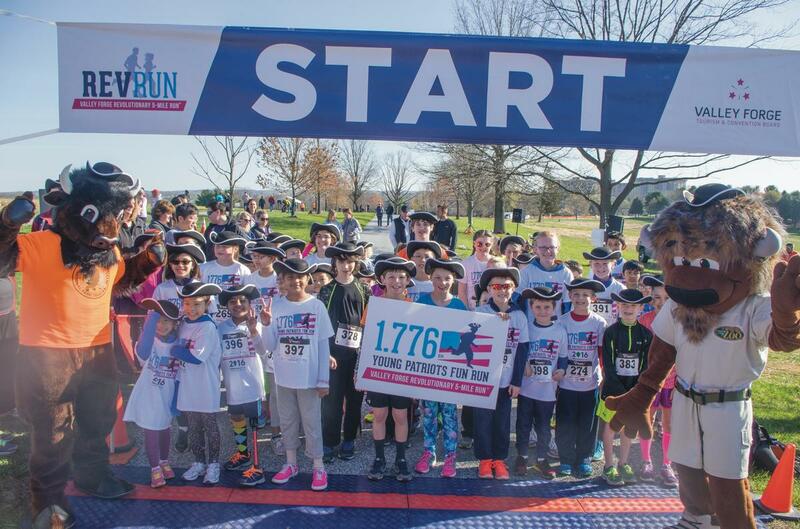 KING OF PRUSSIA, PA – The annual Valley Forge Revolutionary 5-Mile Run® has always been about the spirit of competition and triumph, themes that emerge from the very ground the race is held on: Valley Forge National Historical Park. This year’s event, however, will honor not only athletic skill but academic abilities as well. The VFTCB has partnered with the Freedoms Foundation at Valley Forge to include an essay contest as part of the 2017 Rev Run. Montgomery County students currently in grades four, five and six are being invited to participate in the “Those Who Served” writing challenge. Entrants are asked to research the 1777–1778 winter encampment of the Continental Army and, using a dash of imagination and the full force of their writing skill, create a 100-word journal entry. In crafting their essay, participants can write from the standpoint of an officer, camp follower or even civilian at the time General Washington and his troops were hunkered down in Valley Forge. Historical interpreters and educators at Valley Forge National Historical Park were instrumental in crafting the contest’s theme. The competition is completely online, including entries and rules like the March 31 deadline. “Those Who Served” is open to any fourth, fifth or sixth grader in any Montgomery County public or private school, including those being homeschooled. Students residing in-county but attending an out-of-county school are also eligible. Three winners will be determined by a panel of judges looking for creativity, accuracy and writing excellence. One essay author from each of the targeted grades will receive a $100 U.S. Savings Bond (sponsored by the Freedoms Foundation at Valley Forge) as well as an official Rev Run medal. Run is event initially generated and continually supported by VFTCB. Proceeds from the five-mile USATF-certified race provide ongoing support to enhance the visitor experience at Valley Forge. The program also includes a three-mile walk, a Young Patriots Fun Run and an exhibitor expo. Over its history, Rev Run has resulted in more than $250,000 in donations. These funds have supported initiatives like an outdoor pavilion, signage, trail-clearing and storyteller benches at Valley Forge National Historical Park. The Valley Forge Tourism & Convention Board (VFTCB) is a nonprofit, membership-based sales and marketing organization that actively promotes Valley Forge and Montgomery County, Pa., as a convention site and leisure visitor destination by encouraging patronage of its 500-plus member hotels, restaurants, attractions and services. The Board’s award-winning website, valleyforge.org, serves visitors, meeting planners, tour operators and residents, as well as hosts The Pursuit, a nationally recognized blog. The VFTCB oversees a portfolio of brands that include Valley Forge Sports, Montco 360, Destination Montco Weddings, Patriot Trails and Destination Montco Golf. It is also the publisher of the new dining magazine Crave, issued twice yearly.